Alfred George Davis, (my uncle) was a resident of Ottowa Road in Tilbury with my gran, granddad, his brother and 3 sisters. He became a volunteer sergeant in the RAF during ww2 and was stationed in (I believe) Haverfordwest on coastal command duties. He was posted as missing in 1942 and my mother never heard any more. But, in 1993 my mother told me the wreckage of his Westland Lysander aircraft had been found by divers off the West coast of Wales. An incredible story! The diver who found the wreckage had phoned all Davis’s in Tilbury and Chadwell to find any surviving relative of Alfred after contacting RAF records. 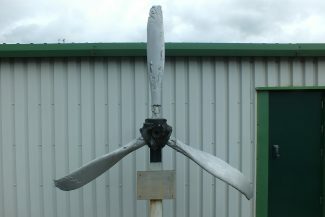 The propeller of Lysander serial V9444 now stands on a plinth at the entrance to Haverfordwest airport. There are Alfred and Davis roads in Tilbury,but I am not sure who they were named after. What an amazing story, thank you for sharing this with the site.